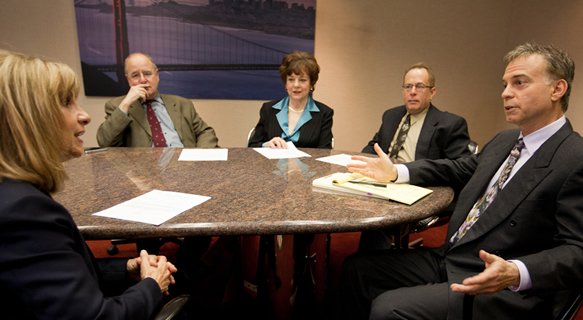 Collaborative Practice is a team-based approach to resolving primarily family law disputes out of court. Unlike mediation, in which the process is guided by one or two neutrals, in collaborative practice each party hires their own collaborative attorney to represent and assist them in non-adversarial, fact-to-face negotiations. In divorce cases, frequently the parties also each hire their own collaborative divorce coach, or sometimes they elect to hire a single, neutral coach, in both instances to ensure that the emotional and psychological aspects of the case are included in the dialog and meaningfully addressed. Additionally, the parties sometimes include on the collaborative team a financial neutral and/or a neutral child specialist when specialized assistance in these areas is desired. This interdisciplinary approach recognizes that divorce is not simply a legal event—rather, it sees divorce as a holistic event that has legal, financial, emotional and psychological facets, all of which need to be addressed. By means of open and respectful discussion by the parties and their team, creative solutions that are not possible in court can be mutually reached, based on full transparency of intent and information. Collaborative practice thus promotes creativity, builds trust, inspires confidence, and helps build a bridge toward a new and healthier relationship going forward. Parties are much more likely to keep agreements that they have worked hard to create in this way, reducing or eliminating the need for future negotiation or court appearances. to support the party(ies) as they navigate the often challenging emotions that come up in the process. to ensure that the parties’ (and their children’s) emotional and psychological needs are identified and addressed, so that these needs can be taken into account in the negotiations. to support the parties’ desire to divorce respectfully and with as little acrimony as possible. to assist the parties in the process of adjusting to a new chapter in their lives.